Gloss can be applied directly onto the lips or on top of Grimas Lipstick or Lip Pencil to give a glossy result. Dab the result with a tissue to matt it off. To make the lips 'kiss-proof', you powder the matt Lipstick (Pure) off copiously with Grimas Fixing Powder. You 'roll' this powder across the lips using a velour powder puff. 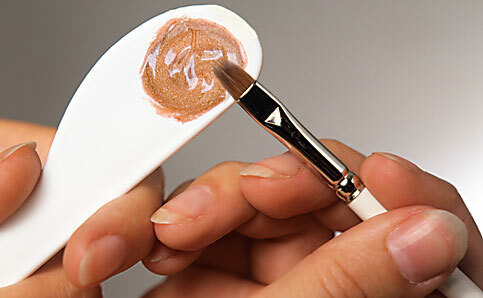 Allow to settle in and remove the excess powder with a Powder-Rouge Brush.